"Joy of Peppers" Vegetables on Canvas 12"x16"
''Joy of Peppers'' Vegetables on Canvas 12''x16'' by TarBox Hollow Poultry at Eny Theme. Hurry! Limited time offer. Offer valid only while supplies last. Receive a beautiful work of vegetable art. 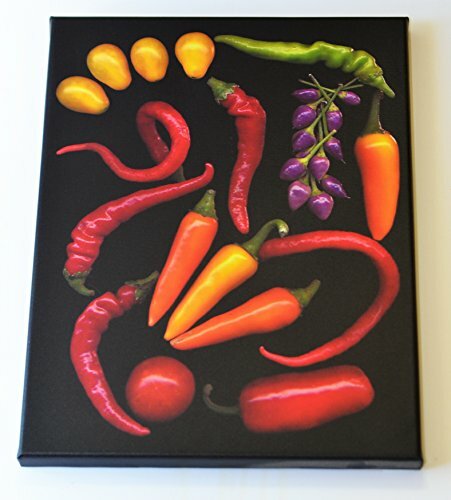 Prints are printed on canvas showing a beautiful array of vibrant fresh vegetables; peppers and tomatoes. Receive a beautiful work of vegetable art. Prints are printed on canvas showing a beautiful array of vibrant fresh vegetables; peppers and tomatoes. Pepper and Tomato Art, will add a unique style of veggie ambiance to your kitchen or restaurant. Photograph is printed on high quality canvas and stretched on wood frame as shown and is ready to hang or can be framed. If you have any questions about this product by TarBox Hollow Poultry, contact us by completing and submitting the form below. If you are looking for a specif part number, please include it with your message. Wife Gift with "Thank You Prayer for Best Wife" Poem. Tulips Photo, 8x10 Double Matted. Special Wife Gift for Anniversary, Birthday, Christmas. Valentine's Day Gifts.